One of the “awards” went to Newsweek for reporting that Duda’s wife, Agata Kornhauser-Duda, did not shake hands with Trump during a visit to Warsaw last summer. In fact, she briefly avoided Trump’s outstretched hand as she reached out to shake the hand of U.S. first lady Melania Trump, but she did shake Trump’s hand afterward. Critics say Trump’s attacks on what he calls “fake news” are attacks on media freedom that embolden authoritarian leaders around the world. 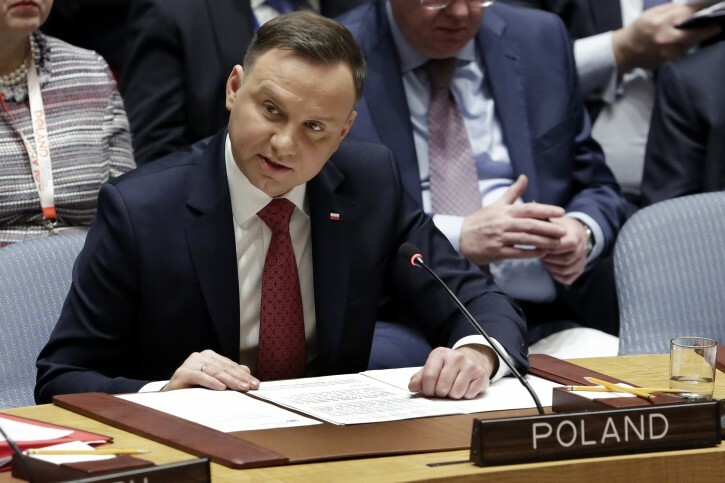 Duda’s tweet comes as Poland faces sharp criticism from the European Union over new laws that increase the ruling party’s control over the judiciary. While the Polish government says the laws are needed to clean up a corrupt judicial system, the EU has threatened sanctions against Poland because it says the laws violate fundamental democratic values. Just like the media the president has his own first amendment rights and is allowed to call out the fake news. So sorry that you fake news liars just finally have someone who is pointing out your truth twisting and half fact telling lies. PS As I have pointed out, feel free to read one the vin articles about Israel toady and notice how those sneaky lairs at Reuters while only writing facts, write such lies and deceit. Go read it, Its on VIN. The media is our enemy. A great endorsement from a rightist Pole president for Herr Trumpf. Other endorsements from Tsar Pootin and China's Red dictator.